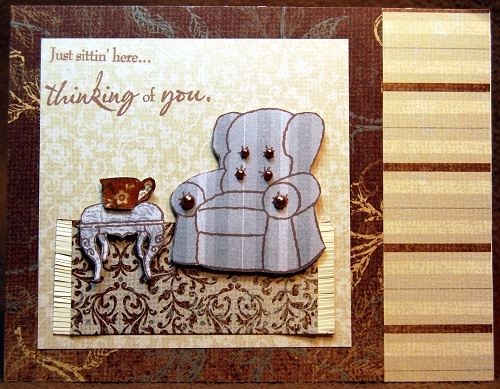 Welcome to our May 2011 Stamp of the Month Blog Hop featuring Chairs to You. If you have come here from Karen's Blog, you are on the right path! The blog hop is a great big circle, so you can start here and work your way all around. This month we have over 50 Close To My Heart Consultants sharing their creations using this month's SOTM and other great CTMH products on their blogs. To follow along just click on the link at the end of the post on each blog to move to the next one! Here we go! ﻿This stamp set just begs to be made into a scene so I created this sweet little vingnette and combined it with our new Card Chatter Sympathy set to create my card. I thought the "just sitting here thinking of you" sentiment on the Card Chatter set was PERFECT to go with the Chairs to You stamps so I picked it up last month in anticipation of this hop. I stamped one of the Chippendale style chairs onto some B&T and cut off the top of the chair to make the stool. The tea cup is from our Tea Time set but I trimmed down the cup to make the size appropriate for my scene. The rug was made with a little B&T paper with Colonial White cardstock cut into fringe attached to the back. Some Mocha Opaques are perfect for buttons on the chair. After I assembled the card I decided to add some Liquid Glass to the top of the tea cup to give it shine like real china. This was such a fun card to make and I'm looking forward to sending it off to my Dad to let him know I'm thinking of him. Now "Hop" on over to Jean's Blog to see her work! Be sure to visit all the Consultants at their Blogs to get some great crafting ideas! Remember, the May SOTM is only available until the 31st so head on over to Paige.MyCTMH.com to see how you can get this stamp set at a discount or even free! Very cute card I love how you made one of the chairs into a stool. Oh WOW Paige this is super gorgeous!!!! I just love what you did with the Bliss papers!! Love the sentiments, the rug, the Bliss paper - everything. Beautiful card! Love this little "set up"...and the rug is genious! 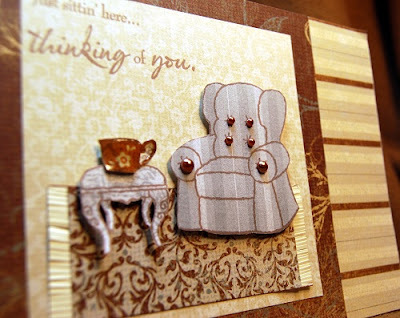 Love your card, especially the chair turned into a stool, the rug, and the brads on the chair - okay, I love it all! TFS! Paige = love the rug!! Your little stool and rug are so adorable! Thanks for the inspiration!